Optional tasks are very common, especially in “request & approve” type of business processes. In many cases the flow of a process may vary based on things like amounts, dates, quantity or choices made by employees while working on a process. Notice the element in red – this is a decision point, for some requests we would need an additional approval from company’s CFO. First we will add a new approval step named “Approve by CFO” to our template. After that we will open a new tab named “Conditions” and add a new condition, which will define when this optional step should be taken. Let start a new process using this process template and see how the optional steps are handled. As you can see, in this case CFO Approval was skipped as unnecessary, since the amount of a request was under $50,000. Skipped tasks are shown in a process view so that it’s clear to all process participants how the process flow is going. Sometimes it could be confusing to see that a particular step was skipped. You can always check what happened and what conditions has failed a check. What if someone just made a mistake and task was skipped when it should be done? Do not wary, as a process manager you can always reopen skipped tasks to let people work on them. But keep in mind that reopened task cannot be turned back to skipped (yet…). You can also combine multiple conditions and specify if all of them or any one of them should be met. What if you have more than one optional tasks? 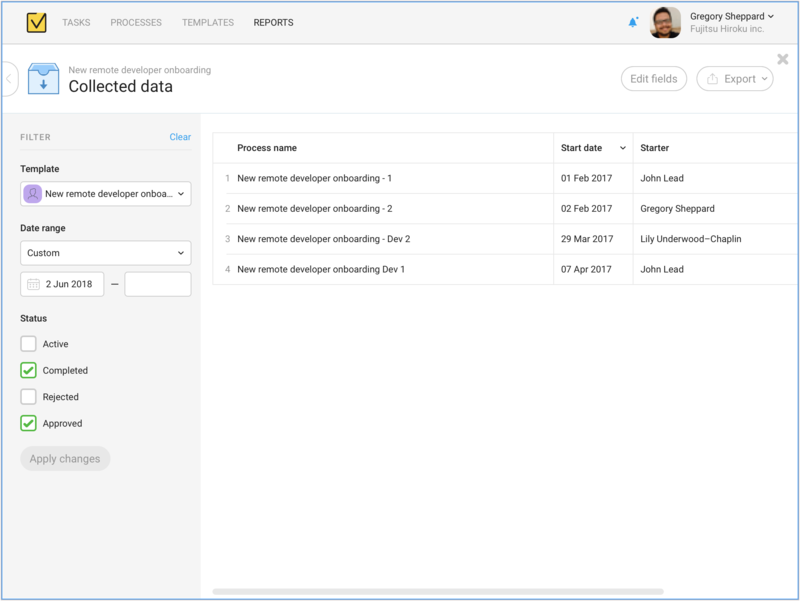 This is where task groups come to rescue, you can group related tasks together to keep your process flow easy to follow and logical. 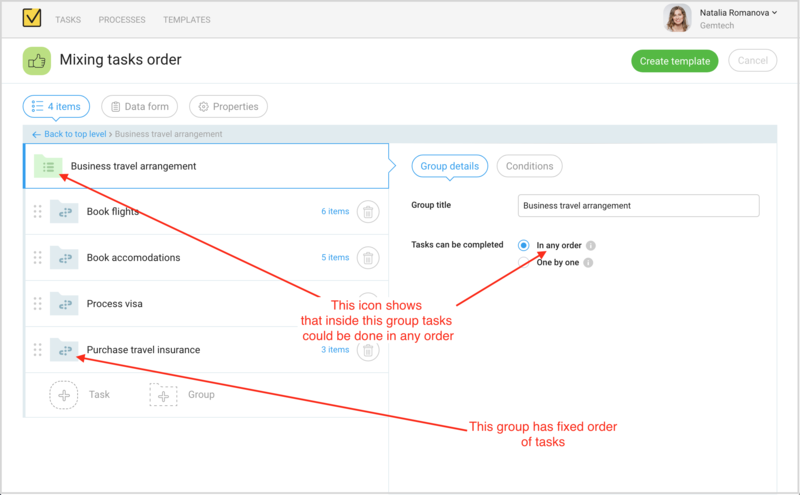 You can use task groups as branches or as nested tasks to keep reasonable level of details. Each nested task has its own assignee. Nested tasks could be done one-by-one or in parallel. 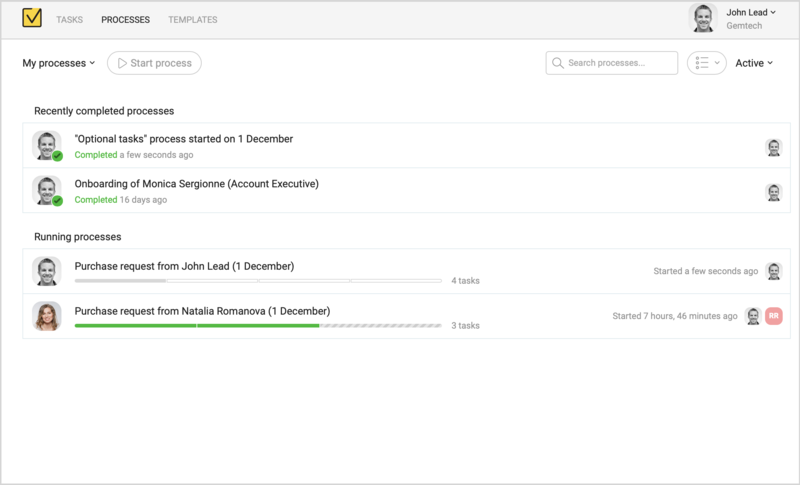 You can create nested tasks on more than one level – just like you can create folders inside folders. If you know how to navigate folders on Mac or Windows – you will feel right at home with Task Groups. Groups can help you structure your process better and to avoid cluttering process view with many similar tasks. 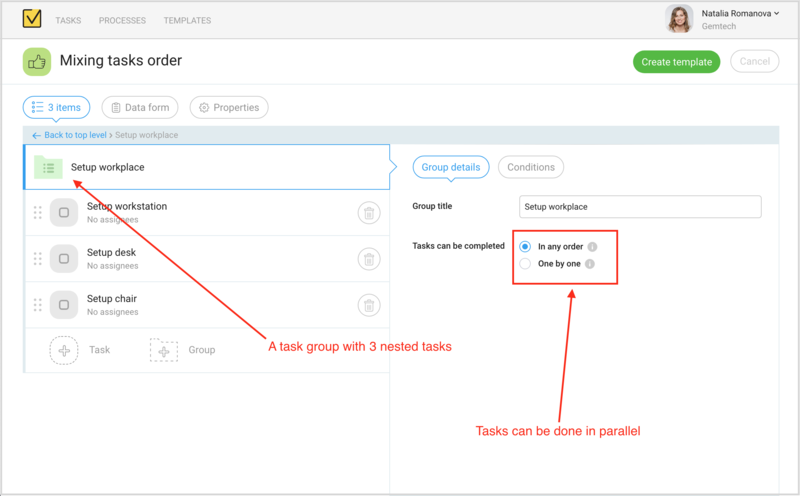 Every task group has own set of settings where you can set order of tasks within group: ordered or in any order (in parallel). We want to work on these tasks one-be-one, but three green tasks should be done in parallel. 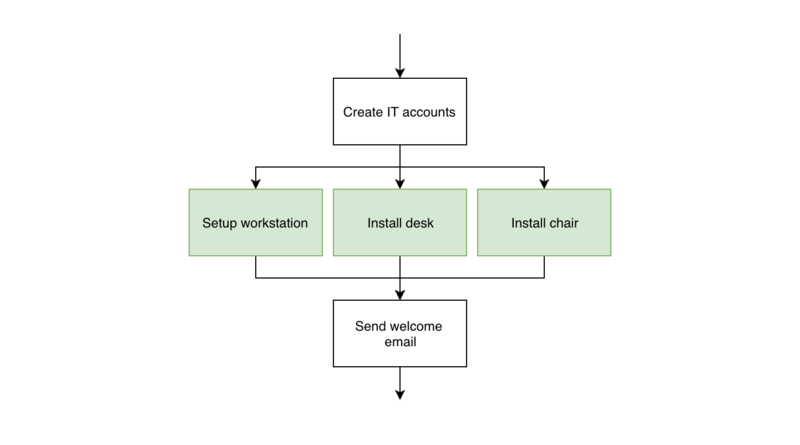 Creating this type of workflow is as easy as adding a new group and configuring it to run tasks in parallel. What if we need multiple sequential branches to work on in parallel? Sounds complicated, I know, but configuring this one is easy as well. When you run this process, all nested groups will be created and employees would be able to work on tasks to book flight and hotel, process visa and purchase insurance – all at a same time. When all tasks in all nested groups would be completed, a parent group – “Business travel arrangement” – will be also marked as completed. 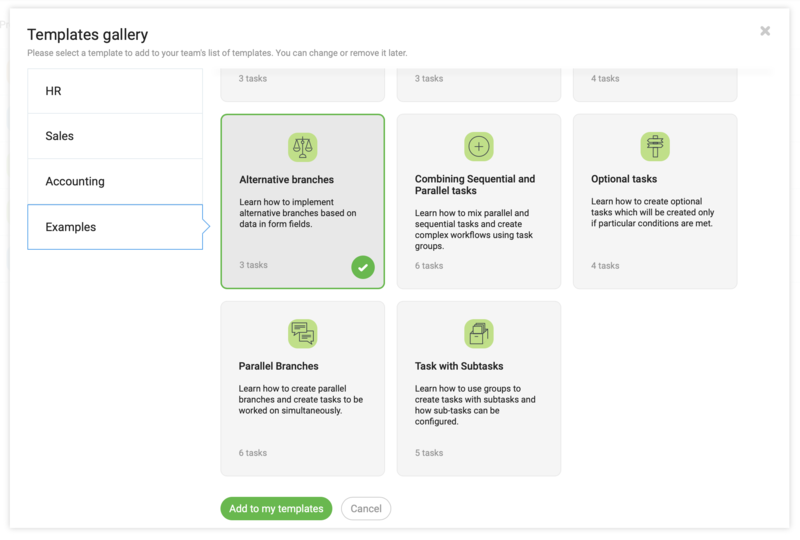 Now that you know how to create multiple branches to work on tasks in parallel, we can use same approach to crate alternative branches. Alternative branches are just like optional tasks, but instead of a single task its a whole group of tasks to be worked on only in some cases, defined by a conditions. 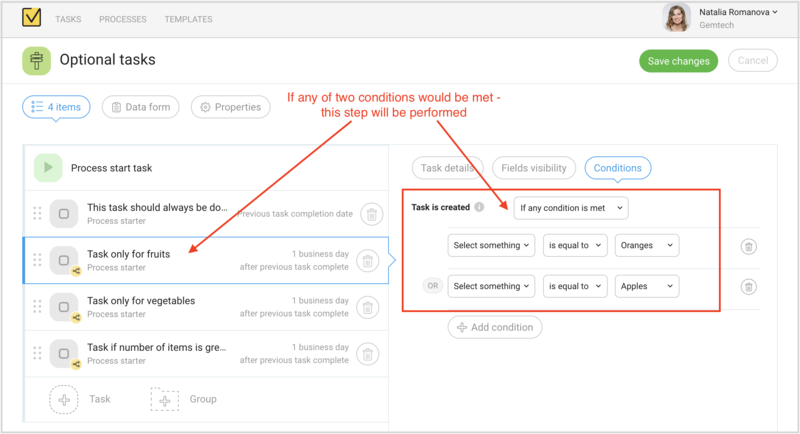 You can configure conditions for any group just the same way as for a task. When you put condition on a task group – it applies to all nested tasks and groups. When condition didn’t match – the whole group will be skipped. 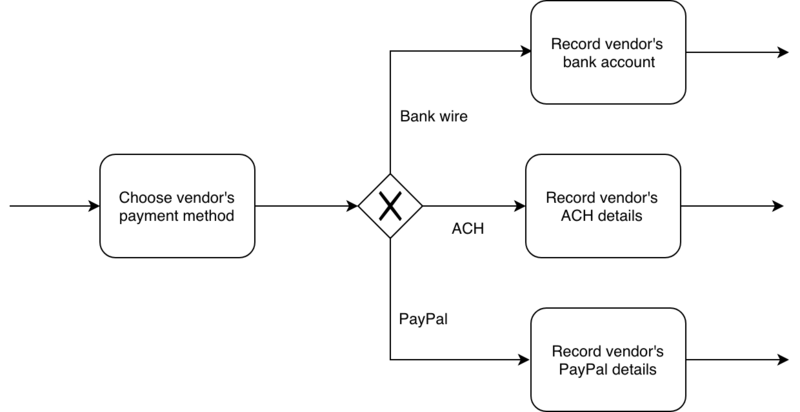 Remember my example with three different payment methods a vendor may require? 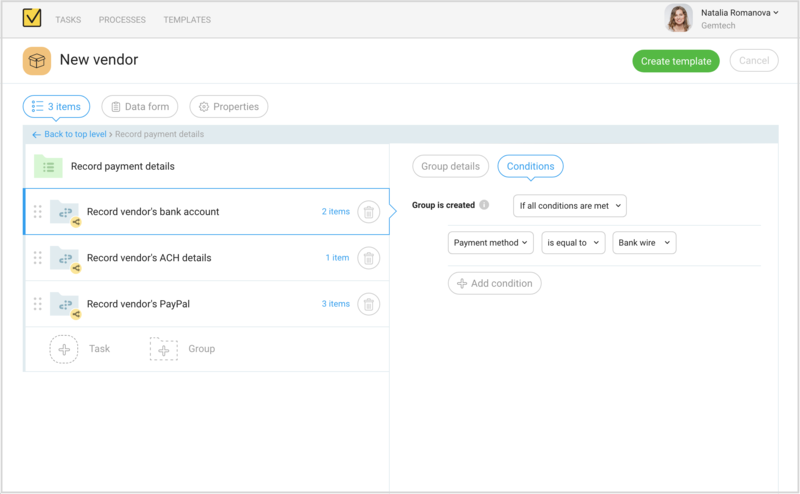 This is how easy is to configure it in Metatask – just create three groups – one for each payment method. I hope you will like this new version of Metatask and new features we’ve introduced will help you create better, cleaner and more manageable processes to better streamline and automate your whole business, department or just your own daily work routines. If you are not sure where to start with conditions and task groups – check out sample templates we’ve prepared for you. Let me give a sneak-pick of a few features we are working on right now to bring it to you in a next release — really soon. This one is simple, you will have option to reopen approval task and change your decision. When you reopen an approval which was “Rejected” a lot of things happens behind the scene — all cancelled tasks are rolled back to where they were before you hit “Reject” button. I can’t even count how many times I’ve been asked about reports over the last year… finally, we bringing reports to Metatask. This one is easier to show. We’ve added a new section with recently completed processes.